TRI-COUNTY AREA--Next Monday, May 28, marks Memorial Day, a day to remember those who have died in active military service. There are a number of events and ceremonies planned to honor those who gave all for the United States. 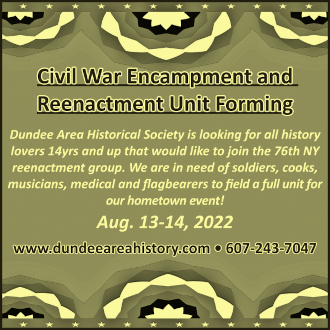 The village of Dundee will have a parade starting at the school at 10 a.m. Monday. The VFW will hold a chicken barbecue Saturday, May 26 from noon to 1:30 p.m. for Memorial Day weekend. 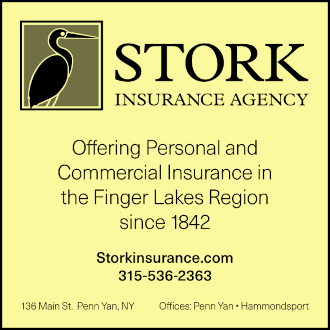 Penn Yan will also have a Memorial Day parade, Monday, May 28. Korean War Veteran Donald Habberfield will serve as Grand Marshall when the parade gets underway at 10 a.m. A ceremony will then be held at the Courthouse Park after the parade. The Master of Ceremonies will be First Sergeant Mark Moon of the U.S. Marine Corps. The featured speaker will be Leigh MacKercher, mayor of the village of Penn Yan. Parade entries are accepted through Sunday, May 27. Call Andy Swarthout at 315-594-6130 for details. The town of Torrey will also hold a Memorial Day service Monday, at 10:30 a.m. The service at the church will feature Sheriff Deputy Richard Simpson as the speaker and include the community choir. The American Legion Post 1571 will have an additional service at Evergreen Cemetery. There will then be a chicken barbecue at the church beginning at noon. 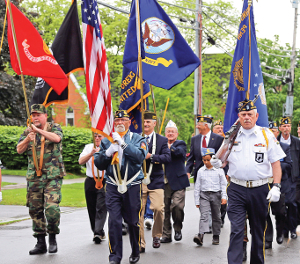 In Hammondsport, the American Legion will have a color guard present at a number of locations. The morning begins at 9 a.m. at the Mitchellsville cemetery. The group will then move to the Pleasant Valley cemetery for a 9:30 a.m. event. At 10 a.m. they will be at the veterans' honor roll memorial in the Hammondsport village square and will march to Elmwood Cemetery for a service. In the afternoon, additional events will be held in Pulteney. Wayne will hold a Memorial Day service Monday, May 28 at 10 a.m. It will be at the Wayne Village Cemetery and feature a service at the church and then Taps will be played at the cemetery. 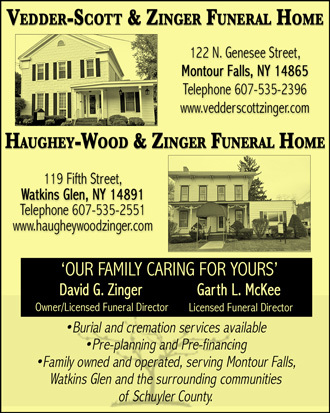 Montour Falls will begin the events in Schuyler County with the annual service at Shequaga Falls Park. The event will begin at 9:30 a.m. There will be local dignitaries as well as the Odessa-Montour band performing. A color guard will also be present for the program. Watkins Glen starts the Memorial Day events with a service at the waterfront Naval Memorial at 10:30 a.m. 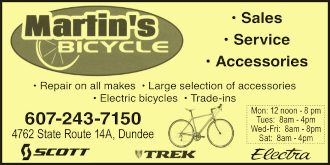 There will then be a service at 11 a.m. at the Watkins Glen Community Center. Due to the sidewalk and road construction on Franklin Street, the 11 a.m. ceremony was relocated from its usual location at the county courthouse to the community center. Kevin Rumsey will be the featured speaker. He served in the U.S. Marine Corps. and now works in law enforcement with the Schuyler County Sheriff. The Schuyler County Veterans Memorial Park at 2558 Rt. 228 in Odessa will have their service at 11 a.m. The community choir will be performing the "Battle Hymn of the Republic" to honor service.